The patient is a healthy 3 week old male with no past medical history. He was born full term via uncomplicated Cesarean Section who presents with increased fussiness. His mother states the patient has simply not been acting like himself. He was taken home on hospital day 1 without issues, but in the last 24 hours, he has been quite fussy. His mother became concerned when he was unable to take his bottle today. The child has been refusing to eat and has been increasingly difficult to console. He has also had less wet diapers than normal today. Mom has not noticed cyanosis during feeding, recent illnesses or fevers. She also denies the presence of emesis, diarrhea, rashes, congestion, or cough. The patient presented with a heart rate of 275 but was warm and well perfused with strong central pulses and brisk capillary refill. EKG was obtained and consistent with supraventricular tachycardia (SVT). Pedi-pads were placed just in case the patiet decompensated and became unstable. However, the patient remained hemodynamically stable therefore vagal maneuvers were attempted first, and the patient converted to normal sinus rhythm within 5 seconds of ice application to his face. He ate well and was back to his baseline mental status soon after his cardioversion. The patient was admitted to cardiology where echocardiogram was performed and was unremarkable. The patient remained in normal sinus rhythm throughout his hospital stay. 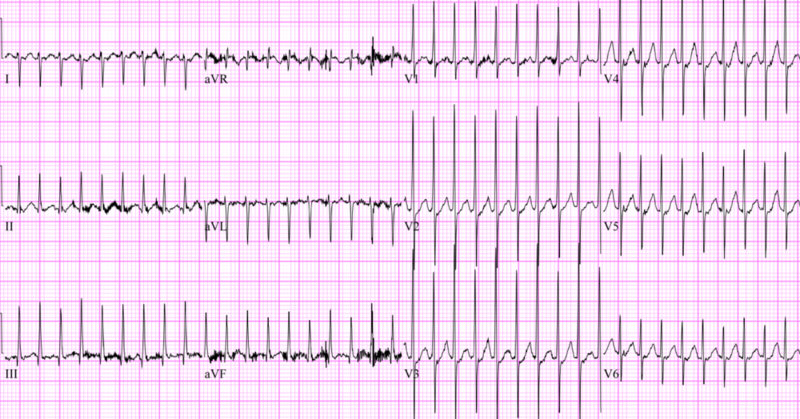 The patient will follow up with cardiology as outpatient and was not sent home on any anti-arrhythmics. Supraventricular tachycardia is the most common arrhythmia in children. SVT most often affects children with normal hearts, although structural abnormalities and critical illness are considered risk factors. The two most common mechanisms of SVT are atrioventricular reentrant tachycardia (AVRT) and atrioventricular nodal reentrant tachycardia (AVNRT). One electrophysiology study of 139 patients found AVRT to account for 73% of cases and AVRT to account for 13% of cases. To help simplify the pathophysiology, one can think of both AVRT and AVNRT are subsets of reentrant tachycardia propagated by slow and fast conduction pathways that devolve into a circular, malignant rhythm. The locale of the reentrant pathway is what differs between the two. AVRT involves an extranodal accessory pathway, while AVNRT involves slow and fast pathways in the AV node itself. Of note, this definition classifies Wolff-Parkinson-White Syndrome into the AVRT category. Diagram by Riley Grosso, MD. This work is licensed under a Creative Commons Attribution-NonCommercial-ShareAlike 4.0 International License. With patients presenting in SVT, it is important to begin with the basic PALS algorithms and immediately differentiate stable versus unstable. If the patient is unstable, simply remember 2 joules per kilogram synced cardioversion, but if the patient is stable, recognize there are multiple treatment options available. As far as recognizing the unstable infant, look for evidence of heart failure, significant pallor, or decreased level of consciousness in addition to simply checking a blood pressure. If the patient requires cardioversion, PALS recommends 0.5-2.0 J/Kg delivered synchronously. Pediatric pads are preferred, but adult pads are an option if no pediatric pads are readily available. If vagal maneuvers fail, adenosine is considered the drug of choice as it is a short acting but quite powerful AV nodal blocking agent that interrupts the reentrant conduction pathways causing the arrhythmia. The recommended dosage in pediatrics is 0.1 mg/kg. If this is not successful, providers may reattempt with 0.2 mg/kg (max of 6mg and 12mg respectively). Other medications to consider would be amiodarone (5mg/kg over 20-60 minutes) or procainamide (15mg/kg over 30-60 minutes), but both of these medications may cause hypotension and involvement of a pediatric cardiologist prior to initiation may be advisable. If ice applied to the patient's face does not work in the stable infant in SVT, have you had success with continued efforts at vagal maneuvers or do you move on to pharmacologic therapy? Discussing pharmacologic cardioversion. There is a decent amount of evidence for verapamil, but it seems like adenosine is the preferred drug in the ED. What is your experience, if any, with verapamil? Let's say we've tried vagal maneuvers and adenosine without success and now are considering a third line agent such as amiodarone, procainamide, and digoxin. What is your preferred third-line agent for cardioversion in the stable neonate in SVT once vagal maneuvers and adenosine have failed? At what point would you consider synchronized cardioversion for a stable neonate in SVT? When is it appropriate to consult pediatric cardiology? Does every stable patient that undergoes successful cardioversion in the ED require inpatient cardiology consultation? or are these patient's safe for outpatient follow up? What if you are in the community taking care of a child with SVT and vagal maneuvers and adenosine have failed? Should the patient be transferred to the nearest children's hospital with a cardiologist or is cardioversion an option if your more than 60 minutes away? A special thank you to Dr. Benjamin Ostro, PGY-4 Emergency Medicine Resident at University of Cincinnati Medical Center, and Dr. Brad Sobolewski, Assistant Professor in Pediatric Emergency Medicine at Cincinnati Children's Hospital Medical Center, for facilitating this discussion and Dr. Christopher J. Statile, Assistant Professor in Pediatric Cardiology at Cincinnati Children's Hospital Medical Center, and Dr. Peace Chike Madueme, Assistant Professor in Pediatric Cardiology at Cincinnati Children's Hospital Medical Center, for participating in our expert commentary. 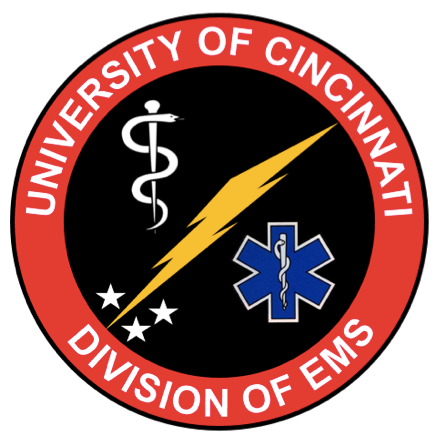 Be sure to check out Dr. Brad Sobolewski's PEM Blog for more pediatric emergency medicine FOAM. 1. Colluci R, Silver M, et al. “Common Types of Supraventricular Tachycardia: Diagnosis and Management.” - American Family Physician. N.p., Oct. 2010. Web. 21 July 2015. 2. Garson A, Gillette PC, Mcnamara DG. Supraventricular tachycardia in children: clinical features, response to treatment, and long-term follow-up in 217 patients. J Pediatr. 1981;98(6):875-82. 3. Kugler JD, Danford DA. Management of infants, children, and adolescents with paroxysmal supraventricular tachycardia. J Pediatr. 1996;129(3):324-38. 4. Spencer B, Chacko J, Sallee D. The 2010 American Heart Association guidelines for cardiopulmonary resuscitation and emergency cardiac care: an overview of the changes to pediatric basic and advanced life support. Crit Care Nurs Clin North Am. 2011;23(2):303-10.